40,000 square feet and four stories of watery fun await guests at this Kansas City resort hotel. Bear Track Landing has eight waterslides and five pools. 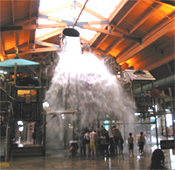 Waterslides include: Alberta Falls: two tube slides covering 626 feet twisting inside and outside the waterpark; Totem Towers: two three-story body slides; Howling Wolf: a three-person toboggan-style ride winding 336 feet throughout the waterpark; and Whooping Hollow: three kiddie slides. You can choose to shoot hoops in one of the activity pools or relax and enjoy your getaway in one of the 20-person whirlpools. The small cubs can play in the zero-depth entry Cub Paw Pool, featuring interactive water toys like tumbling buckets.